Site plan. 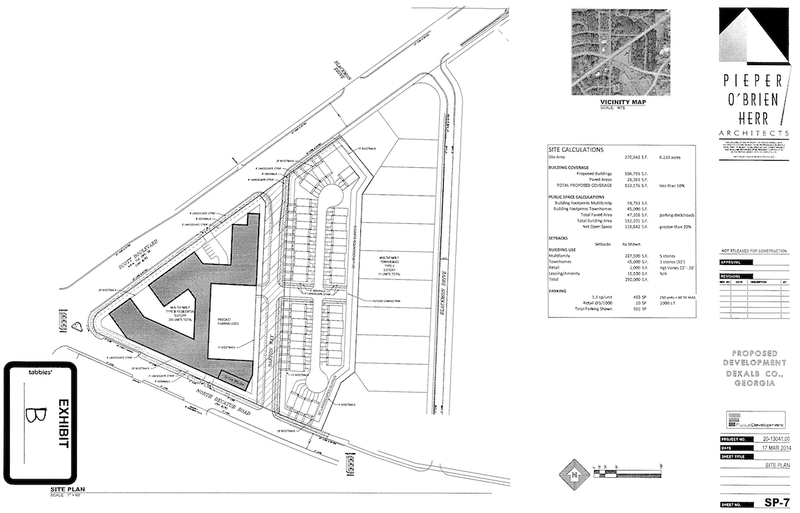 Full-size image appears in the zoning agreement document. On April 8 and 9, 2014, the Board of Commissioners (BOC) and the DeKalb County Zoning Board of Appeals (ZBA) reviewed Fuqua Development’s Scott Boulevard Baptist Church (SBBC) proposal. The plan was presented to the community last February and is outlined here. The BOC and ZBA approved Fuqua Development’s application to rezone and the variances required to redevelop the SBBC site and nearby residential properties on Barton Way. This vote clears the way for Phase 1, to include apartments and townhomes and a “coffee shop.” There was no opposition to the application and the BOC voted to accept the request with conditions negotiated by the Cross-Neighborhoods Committee*. Relevant Cross-Neighborhood Committee documents are available in pdf format: letters of support to the BOC and ZBA, conditions, and schematics. In addition to the conditions, the Cross-Neighborhoods Committee also negotiated a separate, legally binding zoning agreement that among other things secured $60,000 in off-site improvements. This fund will go towards finishing pedestrian improvements at the Medlock / North Decatur Rd. / Scott Blvd. intersection as well as a future sidewalk on Scott Boulevad between Willow Lane and Medlock Road. The legally binding agreement was signed by MANA with the support of the entire Cross-Neighborhoods Committee. Fuqua Development anticipates submitting permits in June and hopes to start site work in August or September. Site work will take about four months and entails demolition, grading, building the underground water detention, etc. We should expect construction to begin in early 2015 and continue for up to 18 months. In the meantime, the Cross-Neighborhoods Committee will begin meeting with Fuqua Development to provide community input for Phase 2 of this project [see our previous post for Phase 2 details]. It will be very sad to lose the Scott Boulevard Baptist Church that served as a landmark and spiritual center in our community for so long. The SBBC congregation will continue to worship as Pastor Greg Smith discusses in this article. With the Medline LCI study in progress, we believe that this area will see great change in the coming years. We feel this development sets a precedent for our area and reflects the collective vision of our community for livability, amenities, walkability and economic sustainability. Nancy Ciliax, Clairmont Heights Community Association Representative; Deanne Thomas, Decatur Heights Neighborhood Transition Team Representative; Theresa Same, Medlock Area Neighborhood Association, Inc. Representative; David Duncan, Medlock Place Neighborhood Association, Inc. Representative; Mary Shellman, Good Growth DeKalb, Inc. Representative; Debra Robinson, Blackmon Drive Resident; Garrett Asay, Ridgeland Park Resident; Todd Link, Springdale Heights Neighborhood Resident. Fuqua is represented by Jeff Fuqua (Principal, Fuqua Development), Heather Correa (Partner, Fuqua Development) and Dennis Webb (Attorney, Smith, Gambrell and Russell). Door to door sales: what's legal in DeKalb Co.?